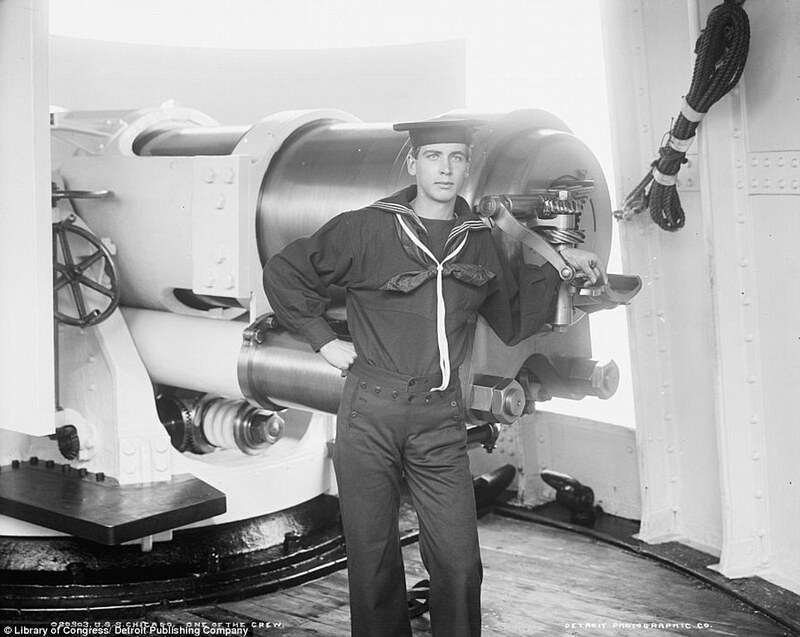 Lieutenant Wendell C. Neville and Marine Guard, USS Maine, ca. 1895. left photo. 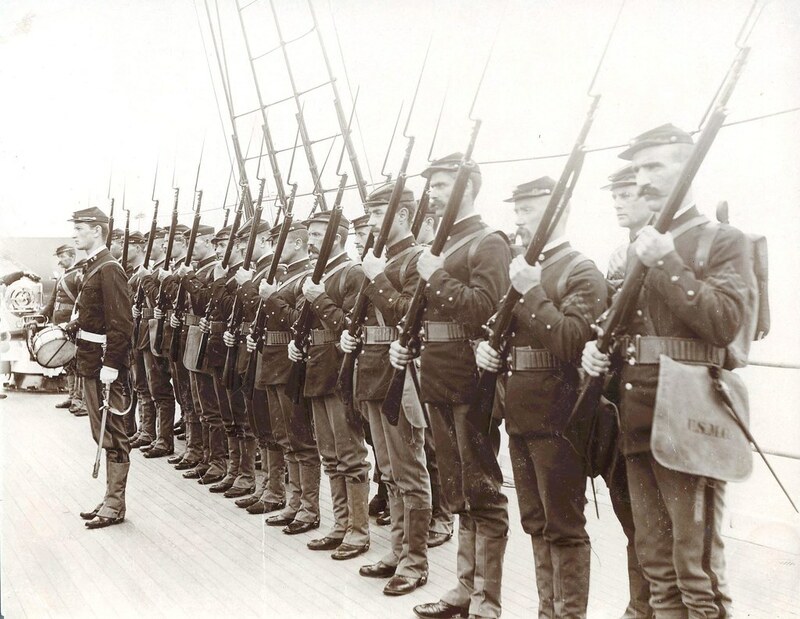 Lieutenant Wendell C. Neville (far left, with sword) presents the Marine Guard aboard the USS Maine, circa 1895. 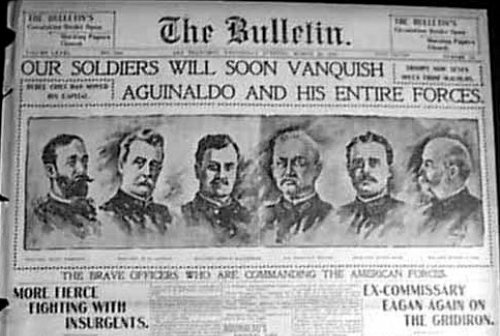 Neville would later become the 14th Commandant of the Marine Corps in 1929; the USS Maine would later be sunk in Havana Harbor in 1898, sparking the Spanish-American War. 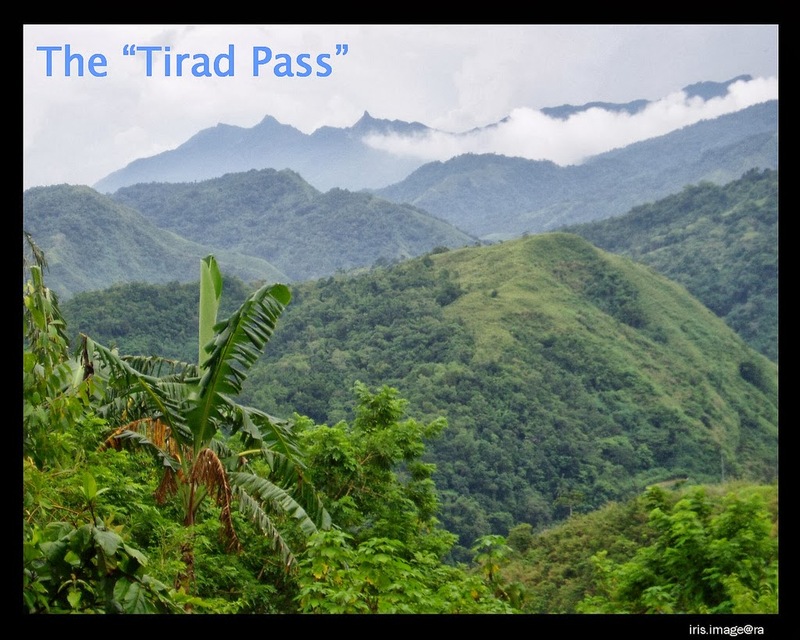 Territorial expansion made possible by railroads and warships helped forge its future at the turn of the 20th century, notable during the Philippine American War. They are images of a nation in motion - of a country building its future with expanding railroads and industrial opportunities. 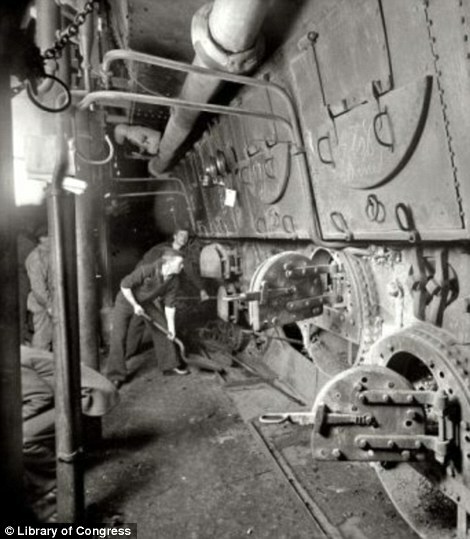 These glorious black-and-white photographs, which have been released by the Library of Congress, reveal America reveling in its new-found productivity, at a time when steam engines and steamboats were forging the nation ahead. 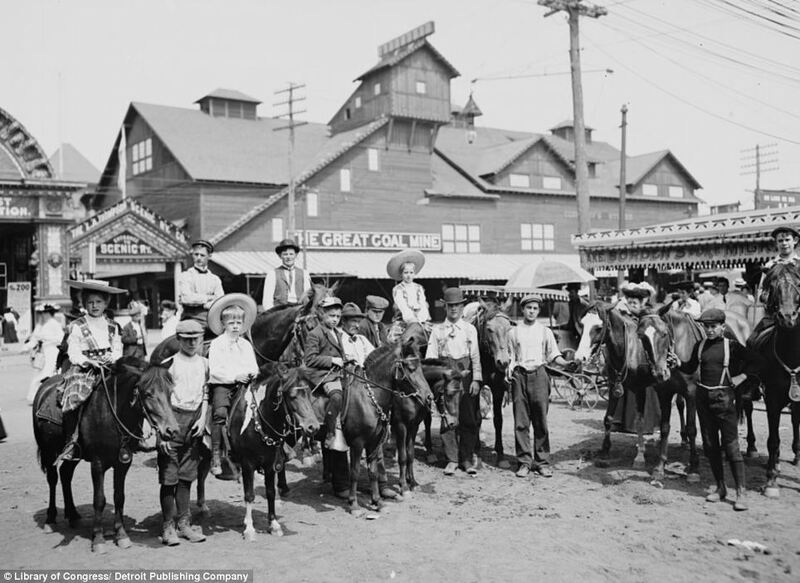 The images, taken between 1870 and 1920, capture the determination with which America tackled the new century - and how the country also began enjoying the fruits of the 19th century's industrial labour, in what was termed the Gilded Age. Original caption: "This is an army supply train en route to Malolos. 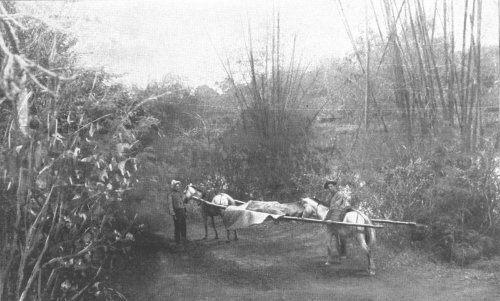 The wagons are hauled by a species of buffalo peculiar to the Philippines. It is a patient animal somewhat livelier than the American ox. It does the hard labor of the islands." 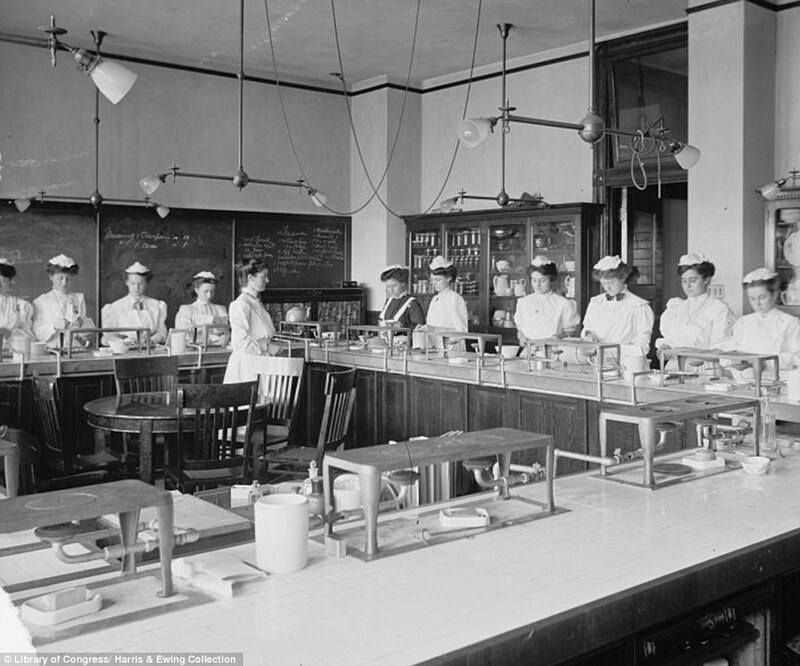 Photo was taken in late March 1899. Crucible of Empire demonstrates how and why the Philippine-American War constitutes such an important milestone in U.S. history. This program examines the events and attitudes that led to war, followed by an exploration of the conflict and its outcome. 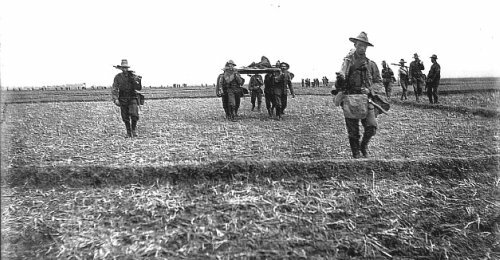 Early film footage and stills of battle scenes, plus rich visuals, a compelling story, and intriguing analogies to current foreign policy make Crucible of Empire a riveting documentary. 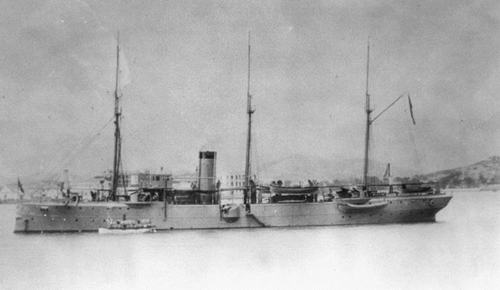 The USS Olympia at Hong Kong Harbor. 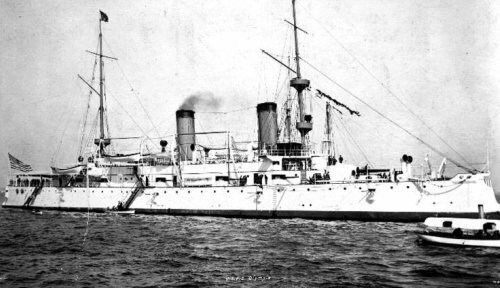 Commodore George Dewey had his ships' brilliant peacetime white and buff schemes over-painted to war gray; this made them less conspicuous in battle. PHOTO was taken in April 1898. 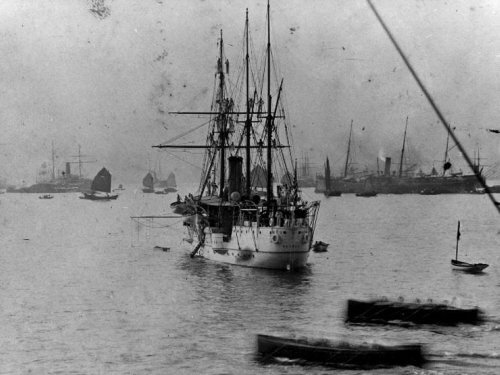 On April 22, 1898, the US Asiatic Fleet commanded by Commodore George Dewey was riding at anchor in the British port of Hong Kong. Navy Secretary John Davis Long (LEFT) cabled the commodore that the United States had begun a blockade of Cuban ports, but that war had not yet been officially announced. On April 25, Dewey (RIGHT) was notified that war had begun and received his sailing orders from Secretary Long : "War has commenced between the United States and Spain. Proceed at once to Philippine Islands. Commence operations at once, particularly against the Spanish fleet. You must capture vessels or destroy. 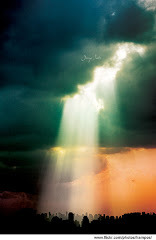 Use utmost endeavors." On that day, due to British neutrality regulations, the American squadron was ordered to leave Hong Kong (ABOVE, in 1898). 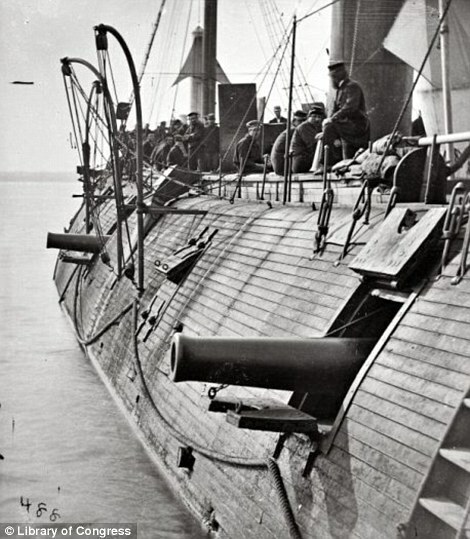 While Dewey's ships steamed out from the British port, military bands on English vessels played "The Star-Spangled Banner," and their crews cheered the American sailors. 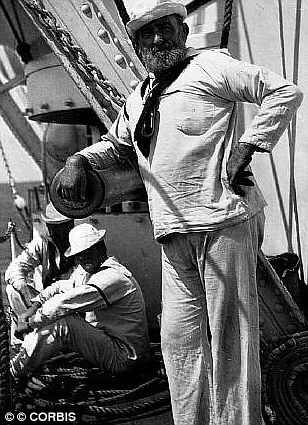 Commodore Dewey violated China's neutrality and anchored his fleet about 30 miles (50 km) down the Chinese coast, at Mirs Bay, and waited for further instructions. 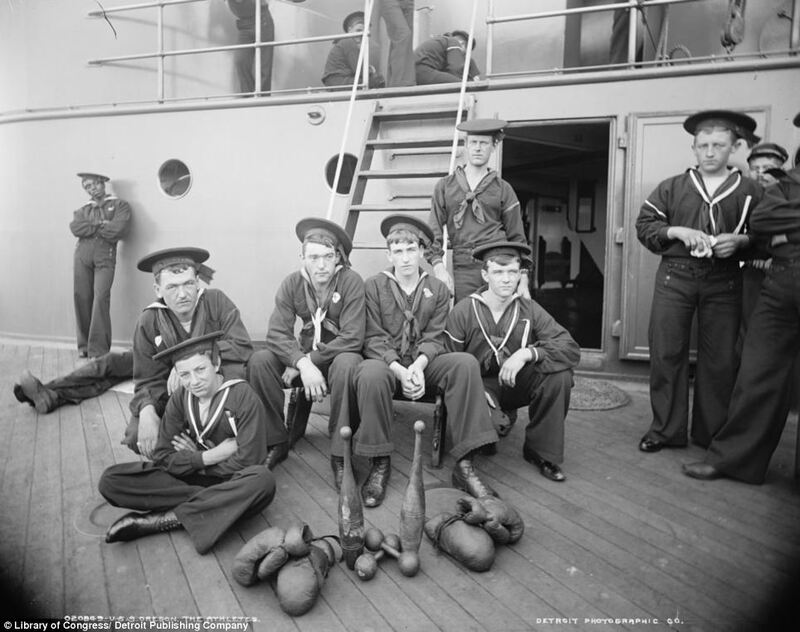 The squadron consisted of 1,744 officers and men, and 9 vessels: the cruisers Olympia,Baltimore, Raleigh and Boston, the gunboats Concord and Petrel, the revenue cutterMcCulloch, and the transport ships Zafiro and Nanshan. 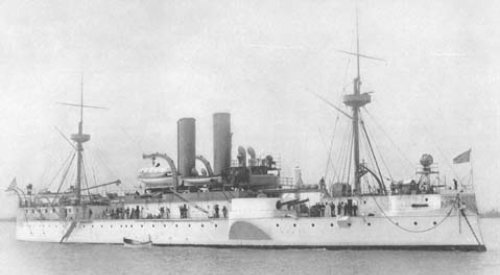 The USS Concord at Hong Kong wearing wartime gray paint, 1898. 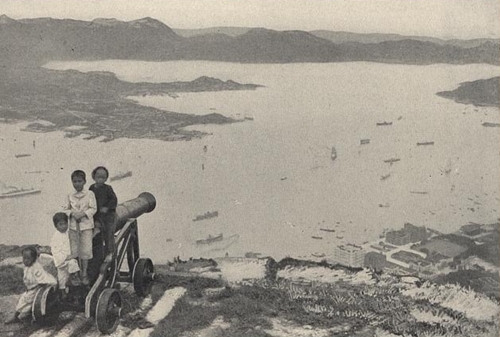 The Chinese did not bother to protest, and for two days the crews drilled with torpedoes and quick-fire guns, and aimed their eight-inchers at cliffside targets on Kowloon Peninsula. The Atlanta Constitution, issue of April 27, 1898. At 2:00 p.m. on April 27, the American squadron raised anchor and left Mirs Bay for the 628-mile run to the Philippines (1,162 km). The Olympia's band blared "El Capitan" and the men shouted, "Remember the Maine!" Regrettably, Jefferson’s sentiments were little heeded in the 1890s. And a new media rogue had arrived — William Randolph Hearst, whose name became synonymous with “Yellow (dishonest) Journalism.” In 1895, the wealthy Hearst purchased the New York Journaland battled Joseph Pulitzer’s New York World to achieve the nation’s highest circulation. Hearst won, learning that in journalism, lies can become “truths” for the right price. But he and Pulitzer shared a common goal: war with Spain over Cuba. Gómez avoided confronting Spanish troops, whom he could not hope to defeat. Instead he launched terrorism. Attempting to expel the Spanish economically, he set ablaze millions of sugar cane acres, making the island a virtual torch. Cubans who refused to support him were hanged from trees or hacked to death with machetes as “traitors.” Gómez’s men descended at night, setting small towns on fire after looting them. 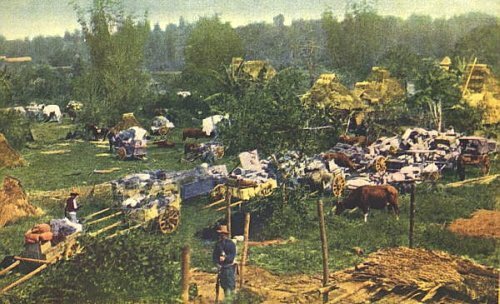 They stole all available cattle and horses, and at harvest seized farmers’ crops — much like the bandits in the filmsThe Seven Samurai and The Magnificent Seven. 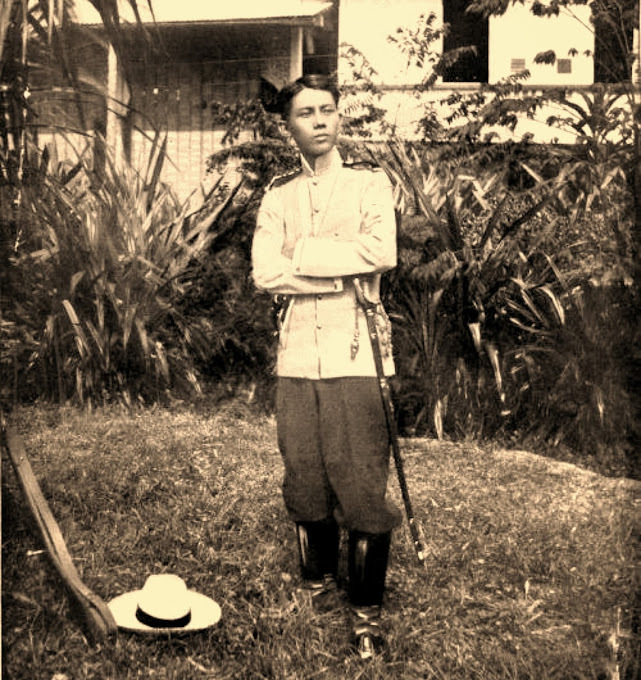 Gómez also seized the farmers’ sons, forcing them into his ranks. Within his army, he was feared as ruthless and dictatorial, meting out the death penalty by machete to soldiers without due process. Perhaps Remington’s most infamous illustration was a naked girl surrounded by three smirking Spanish ruffians, under Hearst’s Journalheadline: “REFINED YOUNG WOMEN STRIPPED AND SEARCHED BY BRUTAL SPANIARDS WHILE UNDER OUR FLAG.” In reality, a Cuban woman, who had aided the revolutionaries, was searched by a Spanish matron, in privacy. Remington had not witnessed the event. 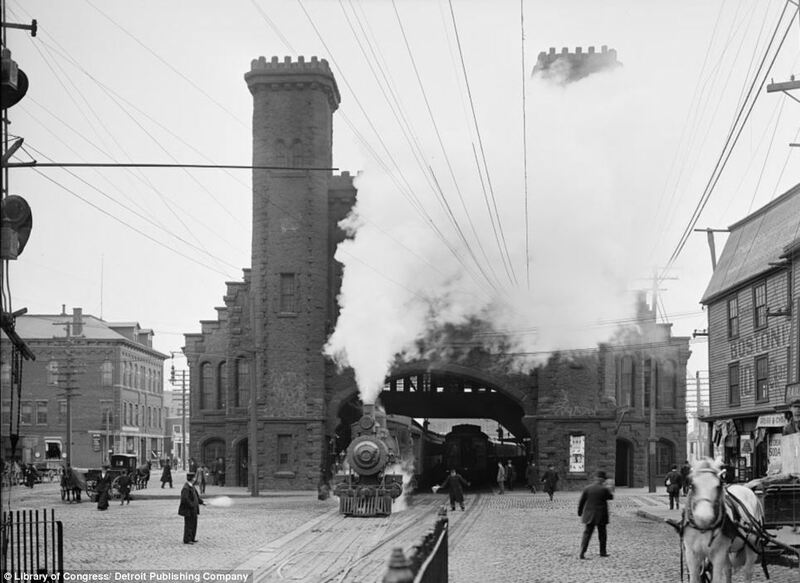 By the 1870s, railroads crawled along the eastern seaboard, following the development of the country's first railroads by Colonel John Stevens in Hoboken, New Jersey. 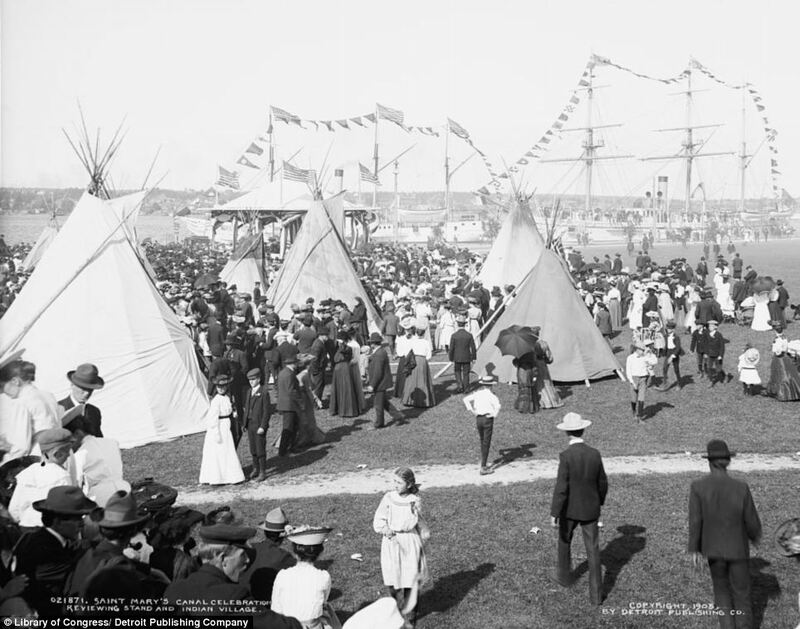 By the Gilded Age and the turn of the century, the country was reliant on them for travel and production. 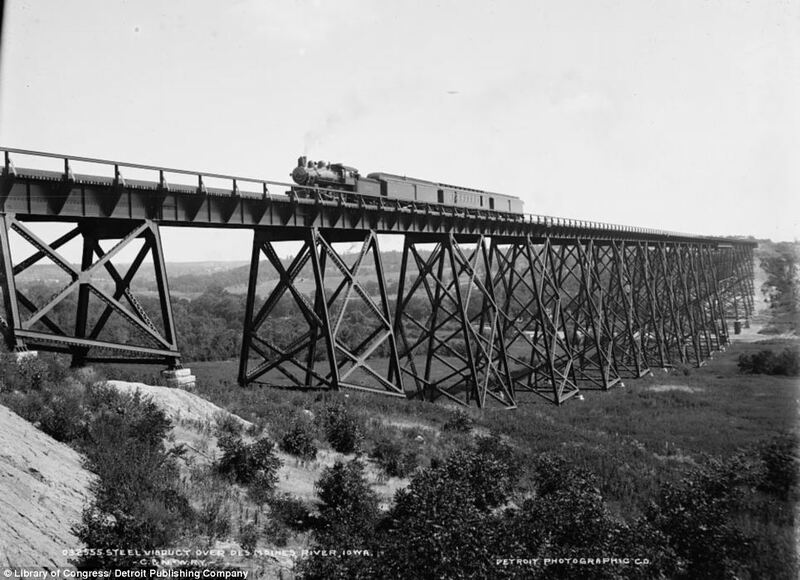 The railroads opened the west and easier connected factories and markets with raw materials. By 1869, a transcontinental railroad finished at Promontory, Utah, providing a six-day service between the East Coast and San Francisco. 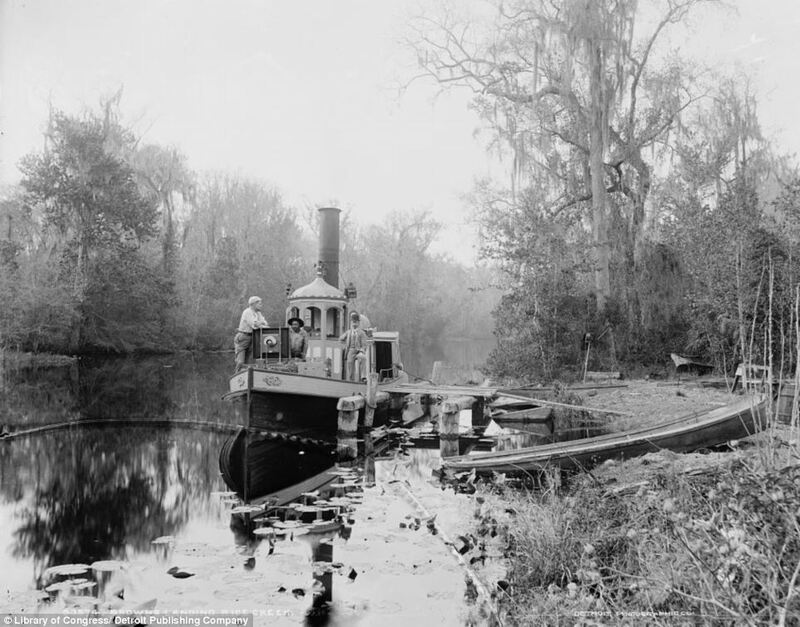 River transportation was already well under way, with the creation of the first steamboat, the Clermont by Rovert Fulton, in the early 1800s. 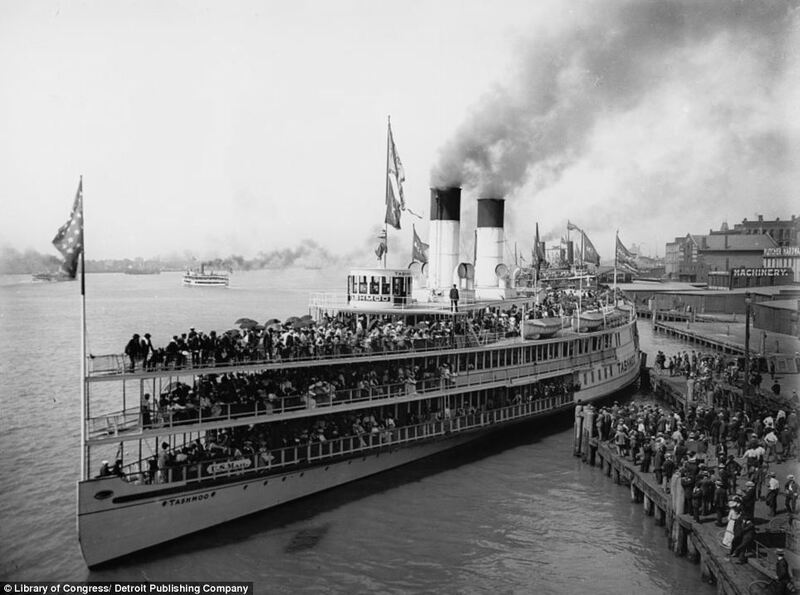 With the opening of the 362-mile-long Erie Canal from the Atlantic Ocean to the Great Lakes, New York City became a powerful trading centre. 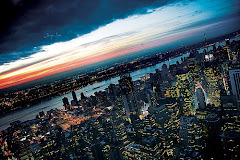 With these developments, and subsequent new industries such as coal mining, steel production and commercial farming, America jumped ahead of Britain in industrialization. The country's steel production rose to overtake the combined efforts of Britain, Germany, and France. 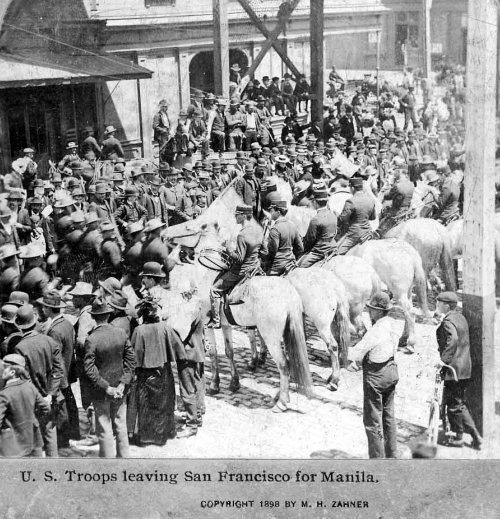 The US Army forces that invaded the Philippines in the Spanish-American and Philippine-American Wars assembled at the Presidio (ABOVE, in 1898) on the northern tip of the San Francisco Peninsula, California. 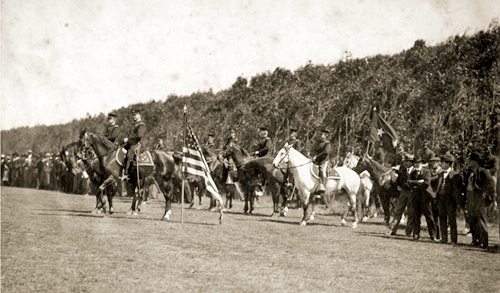 Camps of the 51st Iowa and 1st New York Volunteers at the Presidio, 1898. The Iowans went but the New Yorkers did not proceed to the Philippines. The Presidio was originally a Spanish Fort built by Jose Joaquin Moraga in 1776. It was seized by the U.S. Military in 1846, officially opened in 1848, and became home to several Army headquarters and units. 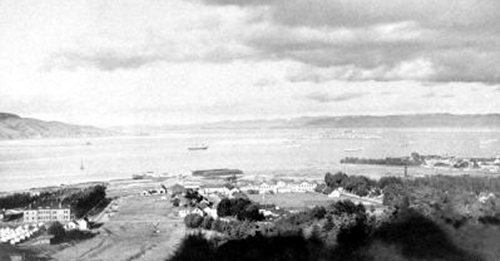 During its long history, the Presidio was involved in most of America's military engagements in the Pacific. It was the center for defense of the Western U.S. during World War II. 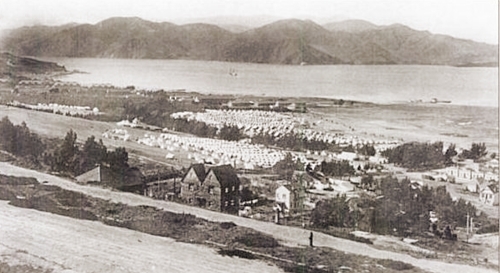 The infamous order to inter Japanese-Americans, including citizens, during World War II was signed at the Presidio. 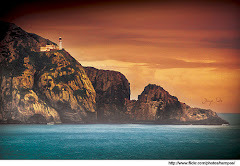 Until its closure in 1995, the Presidio was the longest continuously operated military base in the United States. The lack of transport accommodation, which was corrected by sending vessels from the Atlantic coast of the United States, coupled with the imperative necessity for dispatching troops immediately to the Philippines, resulted in the movement of the 8th Army Corps by 7 installments, extending over a period from May to October. Only 3 of these expeditions [470 officers and 10,464 men] reached Manila in time to take part in the assault and capture of that city on August 13. 1st California Volunteer Infantry Regiment; 2nd Oregon Volunteer Infantry Regiment; 14th United States Infantry Regiment (5 companies); California Volunteer Artillery (detachment). 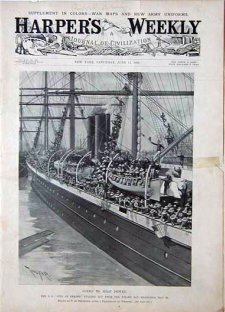 Steamships: City of Sidney, Australia, and City of Peking [RIGHT, Harper's Weekly,June 11, 1898 issue]. Sailed May 25, arrived Manila June 30. 1st Colorado Volunteer Infantry Regiment; 1st Nebraska Volunteer Infantry Regiment; 10th Pennsylvania Volunteer Infantry Regiment; 18th United States Infantry Regiment (4 companies); 23rd United States Infantry Regiment (4 companies); Utah Volunteer Artillery (2 batteries); United States Engineers (detachment). Steamships: China, Colon, and Zealandia. Sailed June 15, arrived Manila July 17. 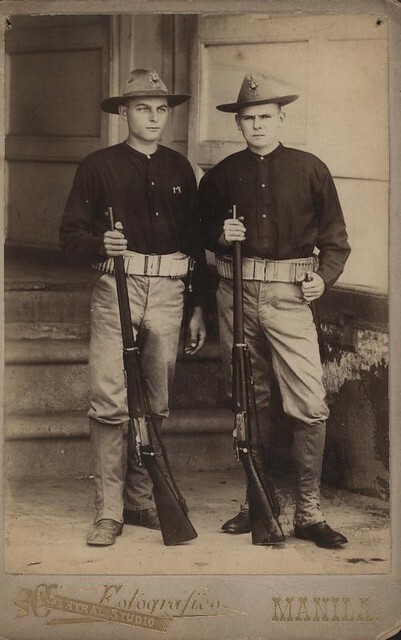 Men of Company D, 1st Idaho Volunteers, who sailed with the Third Expedition to the Philippines in June 1898. Photo was taken in May 1898. 18th United States Infantry Regiment (4 companies); 23rd United States Infantry Regiment (4 companies); 3rd United States Artillery acting as Infantry (4 batteries); United States Engineers Battalion (1 company); 1st Idaho Volunteer Infantry Regiment; 1st Wyoming Volunteer Infantry Regiment; 13th Minnesota Volunteer Infantry Regiment; 1st North Dakota Volunteer Infantry Regiment; Astor Volunteer Artillery; Hospital and Signal Corps (detachments). Steamships: Senator, Morgan City, City of Para, Indiana, Ohio, Valencia, and Newport. Sailed June 27 and 29, arrived Manila July 25 and 31. 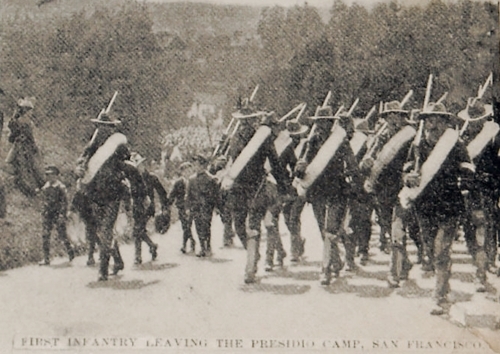 Farewells at Camp Merritt, just outside the Presidio, San Francisco. 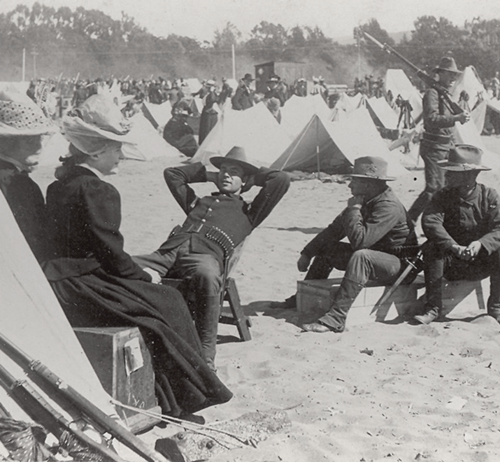 The camp was established on May 29, 1898 but abandoned on August 27 of the same year due to problems with disease, mostly measles and typhoid. 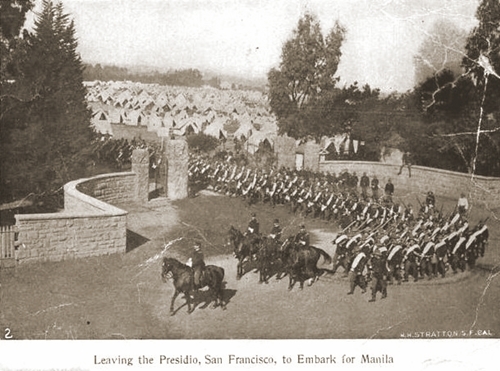 The remaining troops bound for the Philippines were moved to Camps Merriam and Miller a bit north at the Presidio. 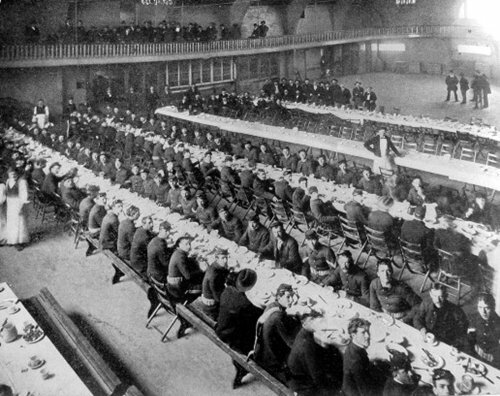 Dinner at the San Francisco armory to 1st California Volunteers, May 1898. The Lombard Gate of the Presidio, built in 1896, where most US troops en route to the Philippines passed through to meet awaiting ships. 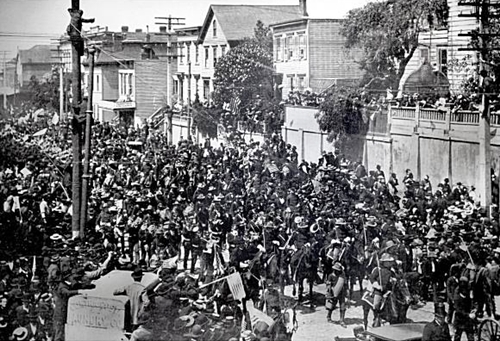 The troops marched down Lombard Street to Van Ness, then to Market Street to the docks. 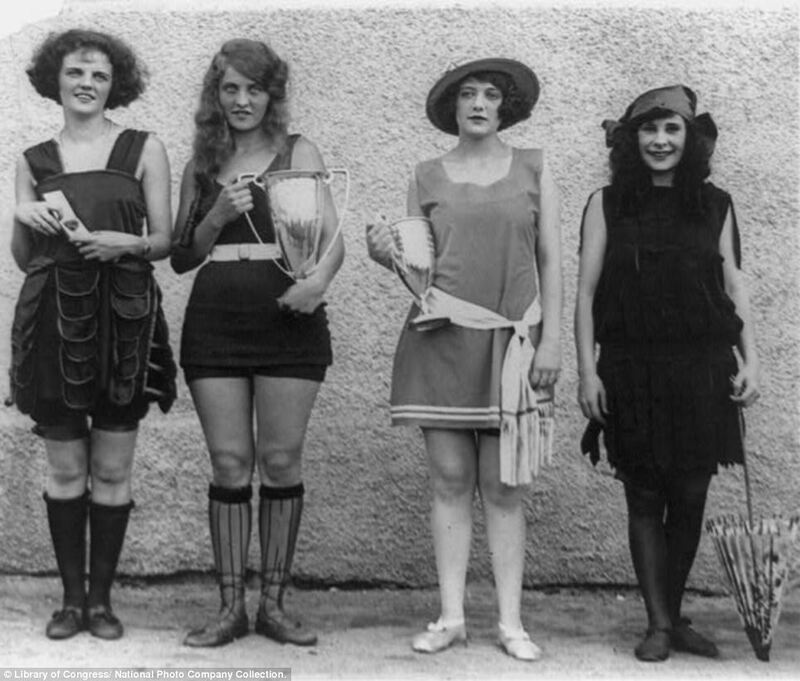 The images indicate how the turn of the century became the early years of materialism and consumerism. With industry in full swing, mass production made prices fall to all time lows, making luxuries more accessible. They are pictures at odds with the struggle being endured in the South in the years following the Civil War and the Industrial Revolution. The southern states were still reliant on cotton and tobacco production, which suffered low prices at that time. 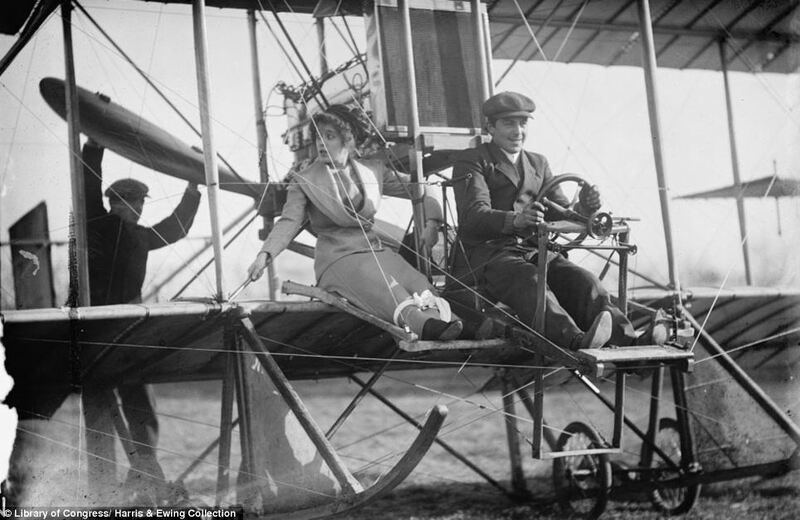 These combined ways of life paved the way for the Progressive Era, which occurred until the 1920s, when the improved communication and travel allowed for the spread of ideas, which lead to social activism. It was sparked by the waste and injustices of the Gilded Age. 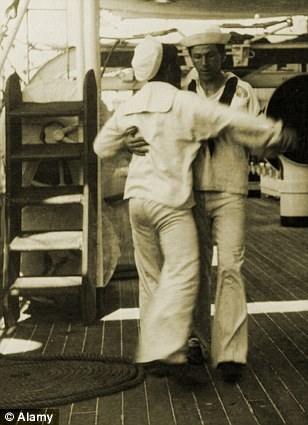 While awaiting the arrival of ground troops, Dewey welcomed aboard his flagship USS Olympia members of the media who clamored for interviews. 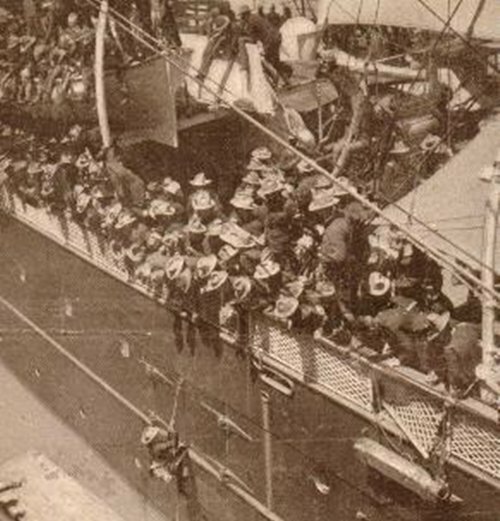 Numerous vessels of other foreign nations, most conspicuously those of Britain, Germany, France, and Japan, arrived almost daily in Manila Bay. 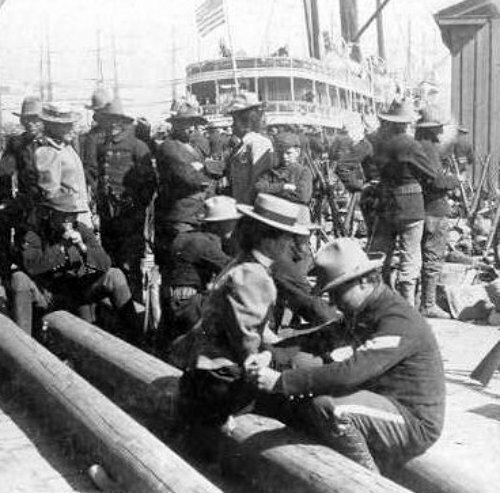 These came under the pretext of guarding the safety of their own citizens in Manila, but their crews kept a watchful eye on the methods and activities of the American Naval commander. 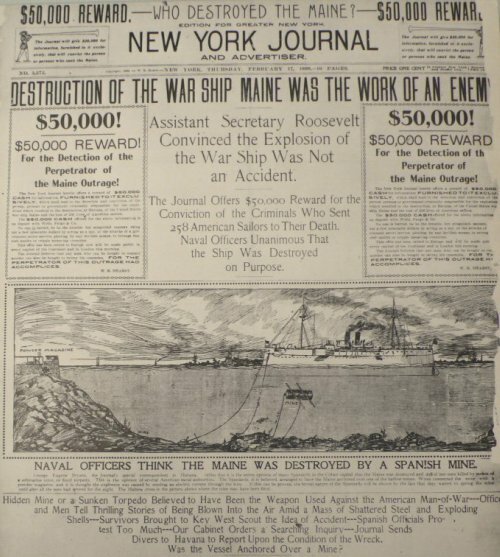 On Feb. 15, 1898, at 9:30 p.m., a mysterious explosion sank the American battleshipUSS Maine in Havana Harbor, killing 264 men. 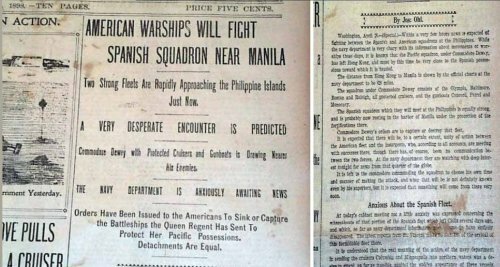 With no proof, purveyors of the "Yellow Press" accused the Spanish of blowing up the ship (although Spain had no motive for doing so). 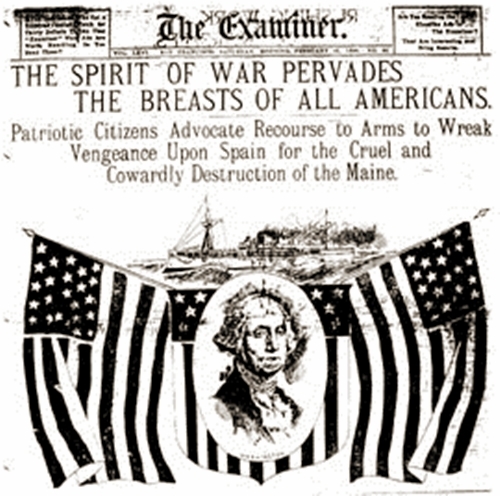 "Remember the Maine" became a call to arms for Americans. 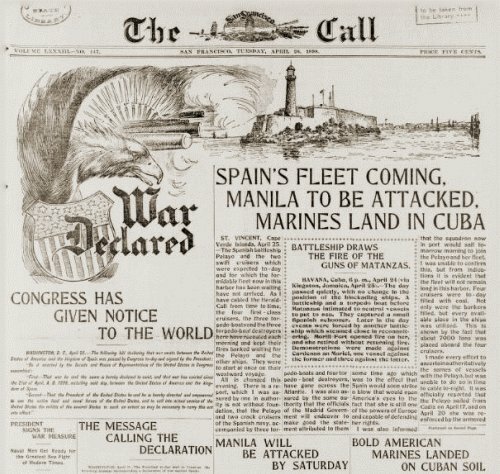 On April 25, 1898, the U.S. Congress voted for war against Spain. Original caption: "Soldiers and their Sweethearts, on the Eve of Departure for Manila." Photo taken in 1898 in San Francisco. 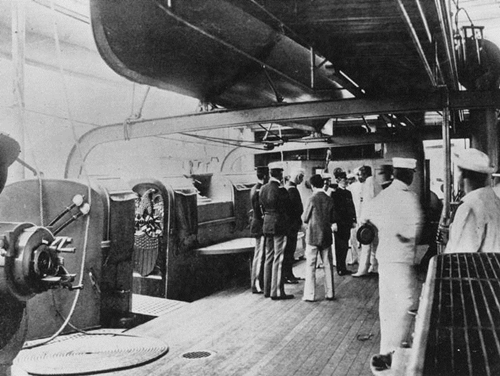 The First Expedition stopped over at Honolulu, Hawaii, on June 1-4. Photo shows Brig. Gen. Thomas M. Anderson visiting the USS Charleston at Honolulu Bay. The cruiser convoyed the expedition to Manila. 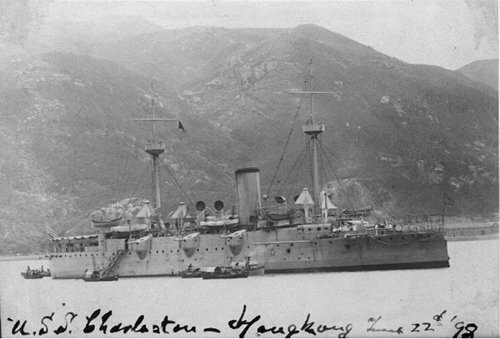 USS Charleston, at Hong Kong Harbor, 1898. 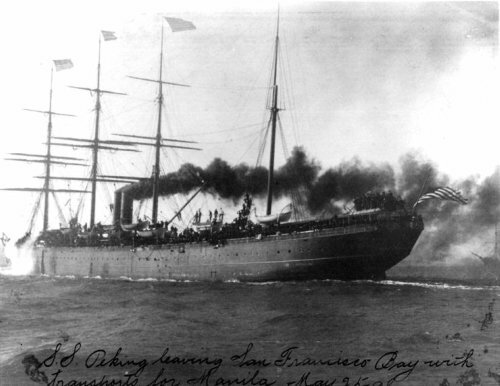 The protected cruiser convoyed the First Expedition from Hawaii to Manila, June 4-30, 1898. 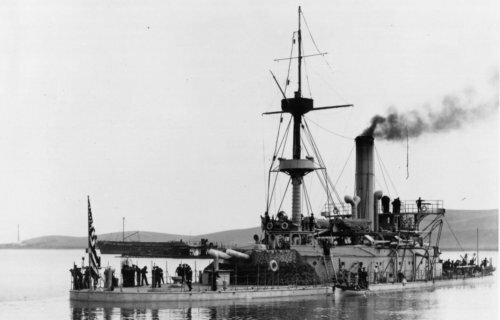 In 1899, during the Philippine-American War, she bombarded Filipino positions to aid Army forces advancing ashore, and took part in the capture of Subic Bay in September 1899. 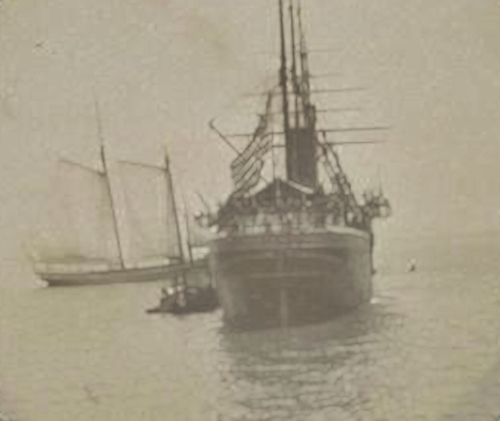 Charleston grounded and was wrecked beyond salvage near Camiguin Island north of Luzon on Nov. 2, 1899. The USS Monterey is seen off Mare Island Naval Yard, Vallejo, California, 23 miles (37 km) northeast of San Francisco. The monitor sailed for Manila Bay on June 11 and arrived there on August 13. Photo was taken in June 1898. 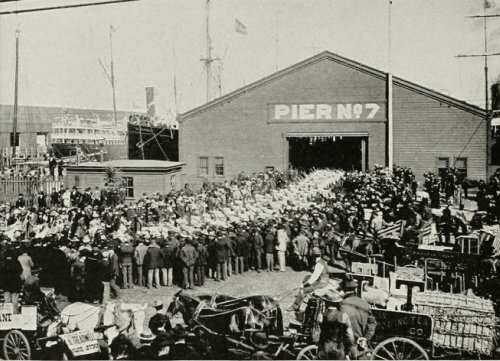 The Second Expedition leaves San Francisco for the Philippines, June 15, 1898. 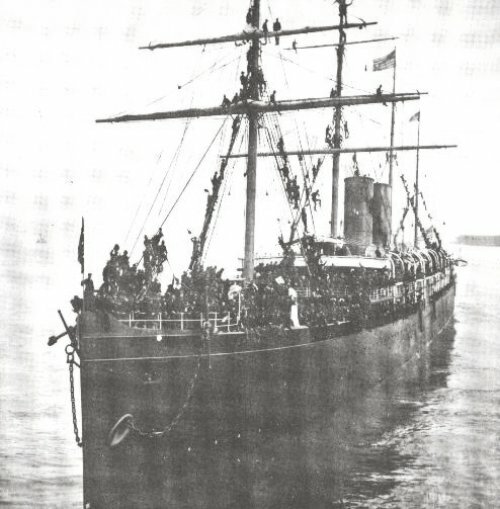 The transport China leaving for Manila as part of the Second Expedition. On board were the 18th US Infantry Regiment (Companies A and G); 1st Colorado Volunteer Infantry Regiment; Utah Volunteer Light Artillery (Battery B, Sections 3,4,5); and US Volunteer Engineers (Company A), June 15,1898. 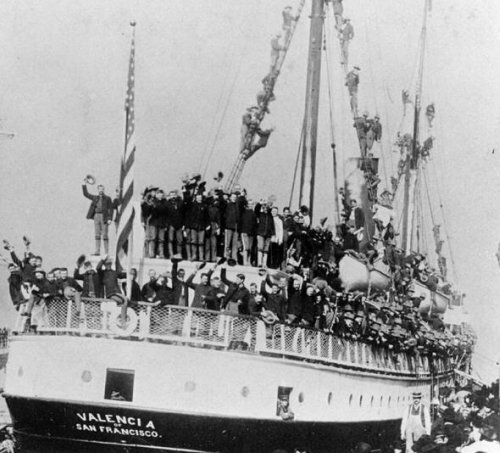 USS Valencia leaving San Francisco with the Third Expedition aboard, June 27, 1898. The transport carried the 1st North Dakota Volunteer Infantry Regiment; 1st Washington Volunteer Infantry Regiment (Companies F, G, I, and L); and the California Heavy Artillery (Batteries A and D). 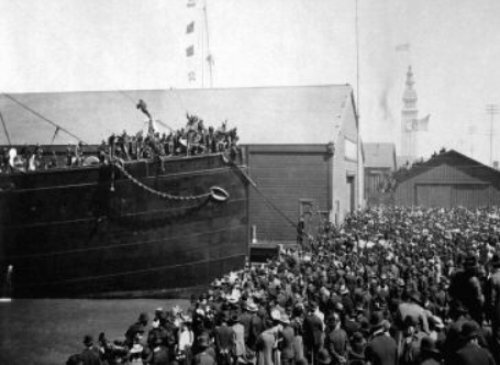 The USS Indiana leaving San Francisco for the Philippines, Third Expedition, June 27, 1898. On board were the 18th US Infantry Regiment (Companies D and H); 23rd US Infantry Regiment (Companies B, C, G, and L); US Engineers Battalion (Company A); and 1st North Dakota Volunteer Infantry Regiment (Company H). 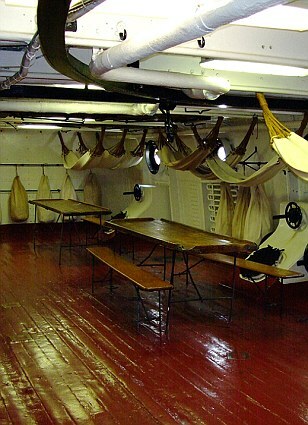 On Monday the Independence Seaport Museum posted a transfer application seeking a charitable organisation to take ownership of the ship, which is a national landmark. A summit will be held next month and the museum is hoping to have a transfer complete by 2012. 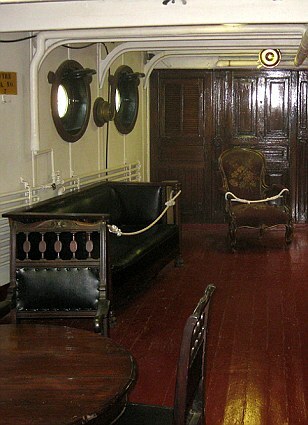 The museum said that it does not have the funds for the essential repairs and upkeep for the floating museum. If the Olympia does not receive attention soon it will sink into the Delaware River. The museum says that since taking over the ship in 1995 it has spent $5.5million on repairs. It has considered responsibly disposing of the vessel as an artificial reef. 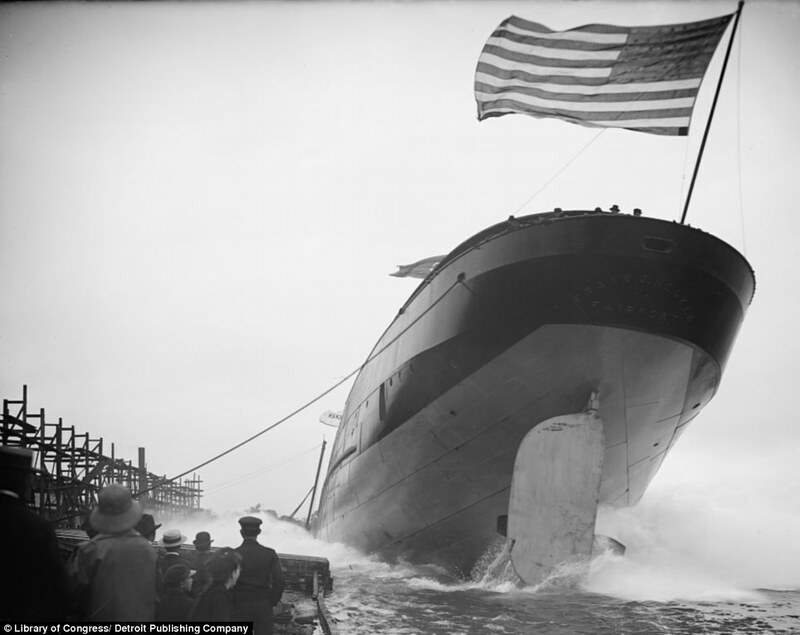 Initial design on the ship began in 1889, and the construction was contracted to Union Iron Works in San Francisco. The estimated cost was $1,796,000. 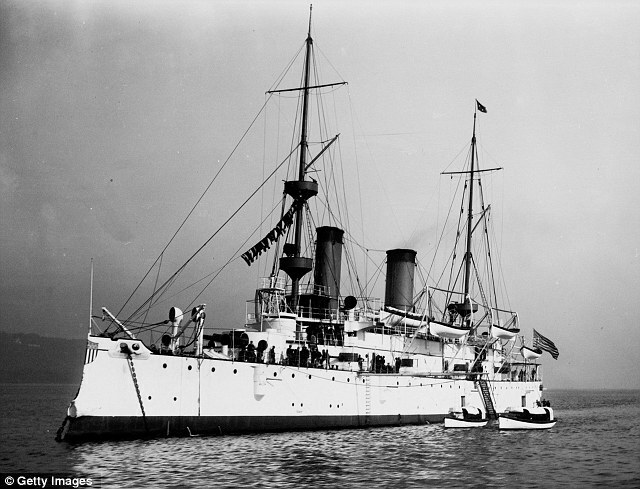 The protected cruiser was in service of the US Navy from 1895 until 1922. It is most famous as the vessel commanded by Commodore George Dewey in 1898 at the Battle of Manila Bay during the Spanish-American War. Stationed in Hong Kong, she was moved into Mirs Bay, China, by Dewey, and eventually to Manila where the Spanish fleet was confronted. 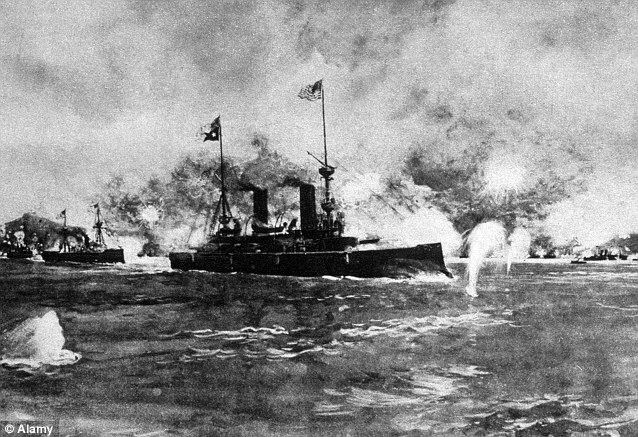 'You may fire when you are ready, Gridley,' was famously uttered by Dewey during the battle which saw the Spanish bombarded into defeat. 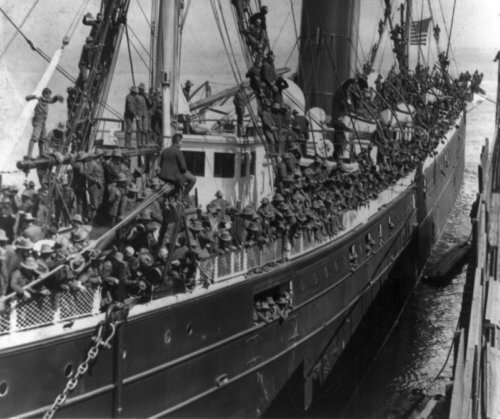 The Olympia, which is 344 feet and 1 inch in length, then served as a Naval Academy training vessel until World War I, when she went back into commission patrolling the U.S. border. Afterwards she was deployed in the Allied intervention in the Russian Civil War. 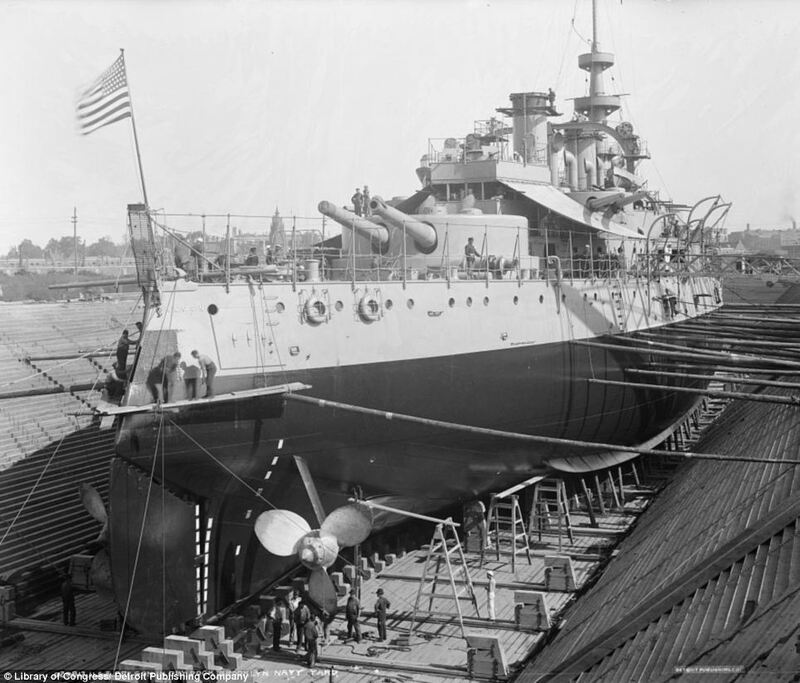 The ship was decommissioned after its final voyage of returning the Unknown Soldier of World War I from Europe to Washington, DC to be buried at Arlington National Cemetery. 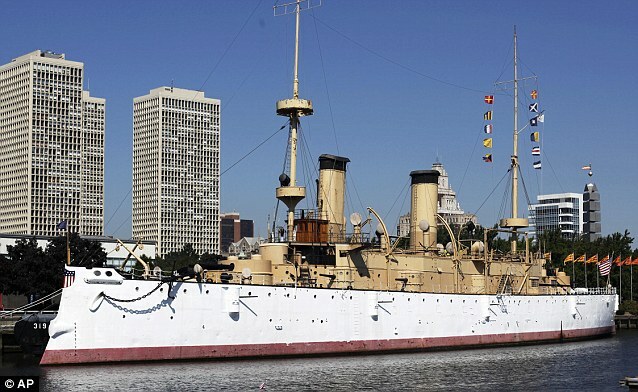 A major restoration came for her in 1957 when the US Navy ceded the ship to the Cruiser Olympia Association, which restored her to her 1898 condition and made her into a museum ship. 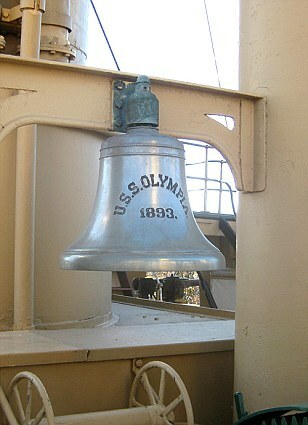 Since, Olympia has enjoyed a life as a major tourist attraction at the Philadelphia’s Independence Seaport Museum, where she sits as America’s oldest floating steel warship. Repairs: The museum said that said that it does not have the funds for the essential repairs and upkeep for the floating museum. If the Olympia does not receive attention soon it will sink into the Delaware River. 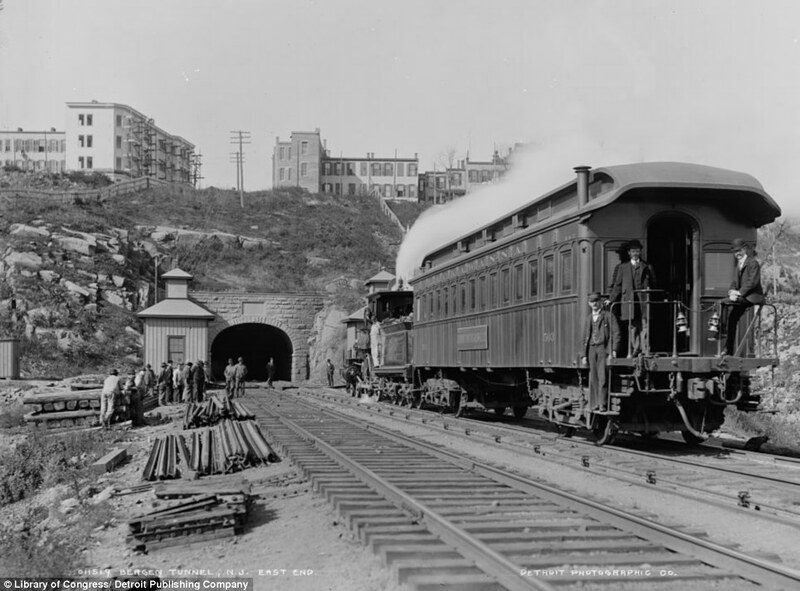 As well as production opportunities, the developed transportation - including the Pullman Sleeping car in 1857 - gave citizens a chance to travel and vacation. 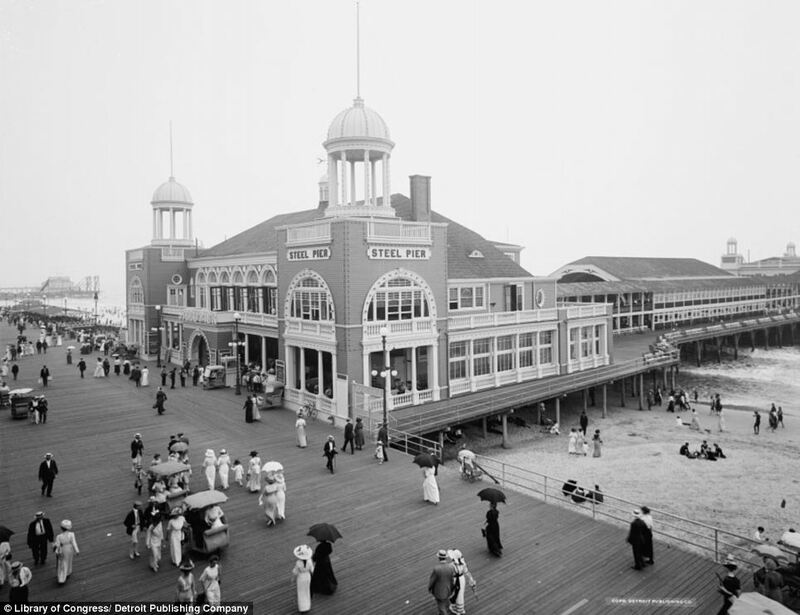 The photographs show swarms of Americans visiting seaside destinations and crowding piers. It was also a time of improved cross-land communication. In 1844, Samuel F. B. Morse created the telegraph and by 1860, the communication network reached across the eastern coast to the Mississippi river. 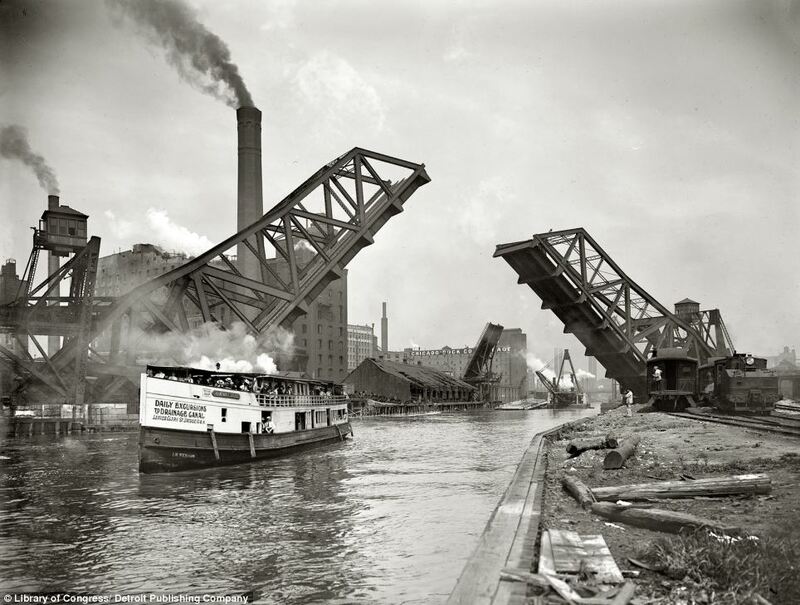 Decades after the industrial revolution - in which transportation had expanded, production had accelerated and electricity had sparked new opportunities - America can be seen enjoying the comfort of success. The overthrow of the Kingdom of Hawaii refers to an event of January 17, 1893, in which anti-monarchial elements within the Kingdom of Hawaii, composed largely of American citizens, engineered the overthrow of its native monarch, Queen Lili'uokalani. Hawaii was initially reconstituted as an independent republic, but the ultimate goal of the revolutionaries was the annexation of the islands to the United States, which was finally accomplished in 1898. By the time the United States got serious about looking beyond its own borders to conquer new lands, much of the world had already been claimed. 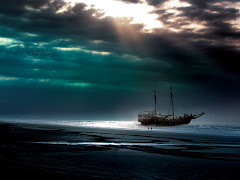 Only a few distant territories in Africa and Asia and remote islands in the Pacific remained free from imperial grasp. Hawaii was one such plum. Led by a hereditary monarch, the inhabitants of the kingdom prevailed as an independent state. American expansionists looked with greed on the strategically located islands and waited patiently to plan their move. Interest in HAWAII began in America as early as the 1820s, when New England missionaries tried in earnest to spread their faith. Since the 1840s, keeping European powers out of Hawaii became a principal foreign policy goal. Americans acquired a true foothold in Hawaii as a result of the SUGAR TRADE. The United States government provided generous terms to Hawaiian sugar growers, and after the Civil War, profits began to swell. A turning point in U.S.-Hawaiian relations occurred in 1890, when Congress approved the MCKINLEY TARIFF, which raised import rates on foreign sugar. Hawaiian sugar planters were now being undersold in the American market, and as a result, a depression swept the islands. The sugar growers, mostly white Americans, knew that if Hawaii were to be ANNEXED by the United States, the tariff problem would naturally disappear. At the same time, the Hawaiian throne was passed to QUEEN LILIUOKALANI, who determined that the root of Hawaii's problems was foreign interference. A great showdown was about to unfold. In January 1893, the planters staged an uprising to overthrow the Queen. At the same time, they appealed to the United States armed forces for protection. Without Presidential approval, marines stormed the islands, and the American minister to the islands raised the stars and stripes inHONOLULU. The Queen was forced to abdicate, and the matter was left for Washington politicians to settle. By this time, Grover Cleveland had been inaugurated President. Cleveland was an outspoken anti-imperialist and thought Americans had acted shamefully in Hawaii. 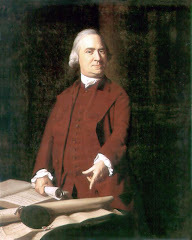 He withdrew the annexation treaty from the Senate and ordered an investigation into potential wrongdoings. Cleveland aimed to restore Liliuokalani to her throne, but American public sentiment strongly favored annexation. The matter was prolonged until after Cleveland left office. 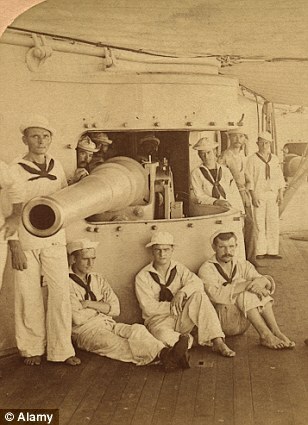 When war broke out with Spain in 1898, the military significance of Hawaiian naval bases as a way station to the SPANISH PHILIPPINES outweighed all other considerations. President William McKinley signed a joint resolution annexing the islands, much like the manner in which Texas joined the Union in 1845. Hawaii remained a territory until granted statehood as the fiftieth state in 1959. Until the 1890s, the Kingdom of Hawaii was an independent sovereign state, recognized by the United States, the United Kingdom, France, Japan, and Germany. Though there were threats to Hawaii's sovereignty throughout the Kingdom's history, it was not until the signing, under duress, of the Bayonet Constitution in 1887, that this threat began to be realized. On January 17, 1893, the last monarch of the Kingdom of Hawaiʻi, Queen Lili'uokalani, was deposed in a coup d'état led largely by American citizens who were opposed to her attempt to establish a new Constitution. The success of the coup efforts was supported by the landing of U.S. Marines, who came ashore at the request of the conspirators. The coup left the queen imprisoned at Iolani Palace under house arrest. The sovereignty of the Kingdom of Hawaii was lost to a Provisional Government led by the conspirators. It briefly became the Republic of Hawaii, before eventual annexation to the United States in 1898. The coup d'état was led by Lorrin A. Thurston, a grandson of American missionaries, who derived his support primarily from the American and European business class residing in Hawaii and other supporters of the Reform Party of the Hawaiian Kingdom. Most of the leaders of the Committee of Safety that deposed the queen were American and European citizens who were also Kingdom subjects. They included legislators, government officers, and a Supreme Court Justice of the Hawaiian Kingdom. According to the Queen's Book, her friend and minister J.S. Walker "came and told me 'that he had come on a painful duty, that the opposition party had requested that I should abdicate.'" After consulting with her ministers, including Walker, the Queen concluded that "since the troops of the United States had been landed to support the revolutionists, by the order of the American minister, it would be impossible for us to make any resistance." Due to the Queen's desire "to avoid any collision of armed forces, and perhaps the loss of life" for her subjects and after some deliberation, at the urging of advisers and friends, the Queen ordered her forces to surrender. Despite repeated claims that the overthrow was "bloodless", the Queen's Book notes that Lilu'okalani received "friends [who] expressed their sympathy in person; amongst these Mrs. J. S. Walker, who had lost her husband by the treatment he received from the hands of the revolutionists. He was one of many who from persecution had succumbed to death." "the military demonstration upon the soil of Honolulu was of itself an act of war; unless made either with the consent of the government of Hawaii or for the bona fide purpose of protecting the imperiled lives and property of citizens of the United States. But there is no pretense of any such consent on the part of the government of the queen ... the existing government, instead of requesting the presence of an armed force, protested against it. There is as little basis for the pretense that forces were landed for the security of American life and property. If so, they would have been stationed in the vicinity of such property and so as to protect it, instead of at a distance and so as to command the Hawaiian Government Building and palace. ... When these armed men were landed, the city of Honolulu was in its customary orderly and peaceful condition. ... "
The Republic of Hawaii was nonetheless declared in 1894 by the same parties which had established the Provisional Government. Among them were Lorrin A. Thurston, a drafter of the Bayonet Constitution, and Sanford Dole who appointed himself President of the forcibly instated Republic on July 4, 1894. The Bayonet Constitution allowed the monarch to appoint cabinet ministers, but had stripped him of the power to dismiss them without approval from the Legislature. Eligibility to vote was also altered, stipulating property value, defined in non-traditional terms, as a condition of voting eligibility. One result of this was the disenfranchisement of poor native Hawaiians and other ethnic groupswho had previously had the right to vote. This guaranteed a voting monopoly by the landed aristocracy. Asians, who comprised a large proportion of the population, were stripped of their voting rights as many Japanese and Chinese members of the population who had previously become naturalized as subjects of the Kingdom, subsequently lost all voting rights. Many Americans and wealthy Europeans, in contrast, acquired full voting rights at this time, without the need for Hawaiian citizenship. In 1891, Kalākaua died and his sister Liliʻuokalani assumed the throne in the middle of an economic crisis. The McKinley Act had crippled the Hawaiian sugar industry by reducing duties on imports from other countries, eliminating the previous Hawaiian advantage due to the Reciprocity Treaty of 1875. Many Hawaii businesses and citizens felt pressure from the loss of revenue; in response Liliʻuokalani proposed a lottery system to raise money for her government. Also proposed was a controversial opium licensing bill. Her ministers, and closest friends, were all opposed to this plan; they unsuccessfully tried to dissuade her from pursuing these initiatives, both of which came to be used against her in the brewing constitutional crisis. Liliʻuokalani's chief desire was to restore power to the monarch by abrogating the 1887 Bayonet Constitution and promulgating a new one, an idea that seems to have been broadly supported by the Hawaiian population. The 1893 Constitution would have widened suffrage by reducing some property requirements, and eliminated the voting privileges extended to European and American residents. It would have disfranchised many resident European and American businessmen who were not citizens of Hawaii. The Queen toured several of the islands on horseback, talking to the people about her ideas and receiving overwhelming support, including a lengthy petition in support of a new constitution. When the Queen informed her cabinet of her plans, they withheld their support due to their clear understanding of the response this was likely to provoke. Besides the threatened loss of suffrage for European and American residents of Hawaii, business interests within the Kingdom were concerned about the removal of foreign tariffs in the American sugar trade due to the McKinley Act (which effectively eliminated the favored status of Hawaiian sugar due to the Reciprocity Treaty). Annexation to the United States would provide Hawaii with the same sugar bounties as domestic producers, which would be a welcome side effect of ending the monarchy. Lorrin Thurston led a small but powerful group, which had been set on goal of annexation to the United States for years before the revolution. The precipitating event leading to the overthrow of the Kingdom of Hawaii on January 17, 1893 was the attempt by Queen Liliuokalani to promulgate a new constitution that would have strengthened the power of the monarch relative to the legislature, where Euro-American business elites held disproportionate power. This political situation had resulted from the so-called 1887 Bayonet Constitution. The conspirators' stated goals were to depose the queen, overthrow the monarchy, and seek Hawaii's annexation to the United States. 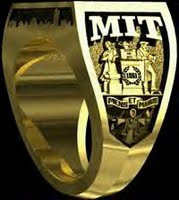 On January 16, the Marshal of the Kingdom, Charles B. Wilson was tipped off by detectives to the imminent planned coup. Wilson requested warrants to arrest the 13 member council, of the Committee of Safety, and put the Kingdom under martial law. Because the members had strong political ties with United States Government MinisterJohn L. Stevens, the requests were repeatedly denied by Attorney General Arthur P. Peterson and the Queen’s cabinet, fearing if approved, the arrests would escalate the situation. After a failed negotiation with Thurston, Wilson began to collect his men for the confrontation. Wilson and Captain of the Royal Household Guard, Samuel Nowlein, had rallied a force of 496 men who were kept at hand to protect the Queen. The Revolution ignited on January 17 when a policeman was shot and wounded while trying to stop a wagon carrying weapons to the Honolulu Rifles, the paramilitary wing of the Committee of Safety led by Lorrin Thurston. The Committee of Safety feared the shooting would bring government forces to rout out the conspirators and stop the coup before it could begin. The Committee of Safety initiated the overthrow by organizing the Honolulu Rifles made of about 1,500 armed local (non-native) men under their leadership, intending to depose Queen Liliʻuokalani. The Rifles garrisoned Ali'iolani Hale across the street from ʻIolani Palace and waited for the Queen’s response. John L. Stevens, an American diplomat, conspired to overthrow the Kingdom of Hawaii. As these events were unfolding, the Committee of Safety expressed concern for the safety and property of American residents in Honolulu. 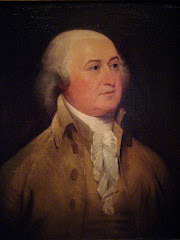 United States Government Minister John L. Stevens, advised about these supposed threats to non-combatant American lives and property by the Committee of Safety, obliged their request and summoned a company of uniformed U.S. Marines from the USS Boston and two companies of U.S. sailors to land on the Kingdom and take up positions at the U.S. Legation, Consulate, and Arion Hall on the afternoon of January 16, 1893. 162 sailors and Marines aboard the USS Boston in Honolulu Harbor came ashore well-armed but under orders of neutrality. The sailors and Marines did not enter the Palace grounds or take over any buildings, and never fired a shot, but their presence served effectively in intimidating royalist defenders. Historian William Russ states, "the injunction to prevent fighting of any kind made it impossible for the monarchy to protect itself." Due to the Queen's desire "to avoid any collision of armed forces, and perhaps the loss of life" for her subjects and after some deliberation, at the urging of advisers and friends, the Queen ordered her forces to surrender. 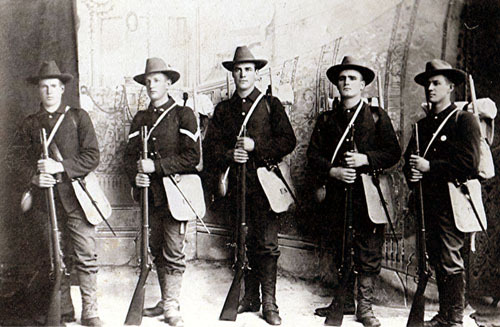 The Honolulu Rifles took over government buildings, disarmed the Royal Guard, and declared a Provisional Government. 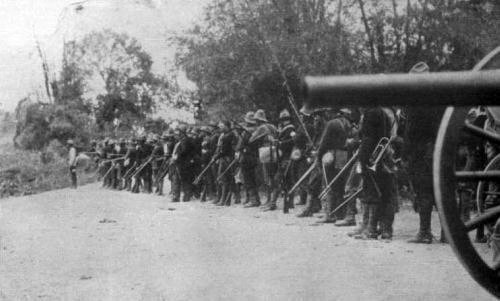 A provisional government was set up with the strong support of the Honolulu Rifles, a militia group who had defended the system of government promulgated by the Bayonet Constitution against the Wilcox Rebellion of 1889 that sought to re-establish the 1864 Constitution in which the monarchy held more power. Under this pressure, to "avoid any collision of armed forces", Liliʻuokalani gave up her throne to the Committee of Safety. Once organized and declared, the policies outlined by the Provisional Government were 1) absolute abolition of the monarchy, 2) establishment of a Provisional Government until annexation to the United States, 3) the declaration of an "Executive Council" of four members, 4) retaining all government officials in their posts except for the Queen, her cabinet and her Marshal, and 5) "laws not inconsistent with the new order of things were to continue". I Liliʻuokalani, by the Grace of God and under the Constitution of the Hawaiian Kingdom, Queen, do hereby solemnly protest against any and all acts done against myself and the Constitutional Government of the Hawaiian Kingdom by certain persons claiming to have established a Provisional Government of and for this Kingdom. That I yield to the superior force of the United States of America whose Minister Plenipotentiary, His Excellency John L. Stevens, has caused United States troops to be landed at Honolulu and declared that he would support the Provisional Government. Now to avoid any collision of armed forces, and perhaps the loss of life, I do this under protest and impelled by said force yield my authority until such time as the Government of the United States shall, upon facts being presented to it, undo the action of its representatives and reinstate me in the authority which I claim as the Constitutional Sovereign of the Hawaiian Islands. Newly inaugurated President Cleveland called for an investigation into the overthrow. This investigation was conducted by former Congressman James Henderson Blount. 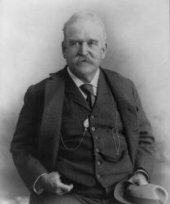 Blount concluded in hisreport on July 17, 1893, "United States diplomatic and military representatives had abused their authority and were responsible for the change in government." Minister Stevens was recalled, and the military commander of forces in Hawaiʻi was forced to resign his commission. President Cleveland stated, "Substantial wrong has thus been done which a due regard for our national character as well as the rights of the injured people requires we should endeavor to repair the monarchy." Cleveland further stated in his 1893 State of the Union Address that, "Upon the facts developed it seemed to me the only honorable course for our Government to pursue was to undo the wrong that had been done by those representing us and to restore as far as practicable the status existing at the time of our forcible intervention." The matter was referred by Cleveland to Congress on December 18, 1893 after the Queen refused to accept amnesty for the revolutionaries as a condition of reinstatement. Hawaii President Sanford Dole was presented a demand for reinstatement by Minister Willis, who had not realized Cleveland had already sent the matter to Congress—Dole flatly refused Cleveland's demands to reinstate the Queen. Procession at Kalakaua's Jubilee, November 16th, 1886. King and Queen leading the way, Liliuokalani and her husband John Owen Dominis following. The Senate Foreign Relations Committee, chaired by Senator John Tyler Morgan (D-Alabama), continued investigation into the matter based both on Blount's earlier report, affidavits from Hawaii, and testimony provided to the U.S. Senate in Washington, D.C.. The Morgan Report contradicted the Blount Report, and found Minister Stevens and the U.S. military troops "not guilty" of involvement in the overthrow. Cleveland ended his earlier efforts to restore the queen, and adopted a position of official U.S. recognition of the Provisional Government and the Republic of Hawaii which followed. The Native Hawaiian Study Commission of the United States Congress in its 1983 final report found no historical, legal, or moral obligation for the U.S. government to provide reparations, assistance, or group rights to Native Hawaiians. In 1993, the 100th anniversary of the overthrow of the Kingdom of Hawaii, Congress passed a resolution, which President Clinton signed into law, offering an apology to Native Hawaiians on behalf of the United States. This law is known as the Apology Resolution. Every government with a diplomatic presence in Hawaii recognized the Provisional Government within 48 hours of the overthrow, including the United States, although the recognition by the United States government and its further response is detailed in the section above on "American Response". Countries recognizing the new Provisional Government included Chile, Austria-Hungary, Mexico, Russia, the Netherlands, Imperial Germany, Sweden, Spain, Imperial Japan, Italy, Portugal, The United Kingdom, Denmark, Belgium, China, Peru, and France. When the Republic of Hawaii was declared on July 4, 1894, immediate recognition was given by every nation with diplomatic relations with Hawaii, except for Britain, whose response came in November 1894. Sanford Dole and his committee declared itself the Provisional Government of the Kingdom of Hawaiʻi on July 17, 1893, removing only the Queen, her cabinet, and her marshal from office. On July 4, 1894 the Republic of Hawaiʻi was proclaimed. Dole was president of both governments. As a republic, it was the intention of the government to campaign for annexation with the United States of America. The rationale behind annexation included a strong economic component—Hawaiian goods and services exported to the mainland would not be subject to American tariffs, and would benefit from domestic bounties, if Hawaii was part of the United States. This was especially important to the Hawaiian economy after the McKinley Act of 1890 reduced the effectiveness of the Reciprocity Treaty of 1875 by raising tariffs on all foreign sugar, and eliminating Hawaii's previous advantage. A four day uprising between January 6 and 9, 1895, began with an attempted coup d'état to restore the monarchy, and included battles between Royalists and the Republic. Later, after a weapons cache was found on the palace grounds after the attempted rebellion in 1895, Queen Liliʻuokalani was placed under arrest, tried by a military tribunal of the Republic of Hawaii, convicted of misprision of treason and imprisoned in her own home. 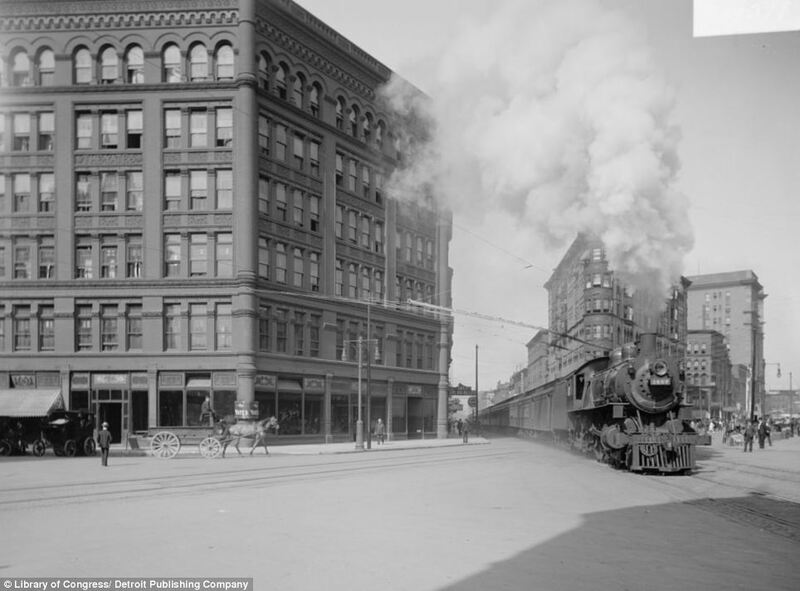 In 1897, William McKinley succeeded Cleveland as president. A year later he signed the Newlands Resolution, which provided for the official annexation of Hawaii on July 7, 1898. The formal ceremony marking the annexation was held at Iolani Palace on August 12, 1898. Almost no Native Hawaiians attended, and those few who were on the streets wore royalist ilima blossoms in their hats or hair, and, on their breasts Hawaiian flags with the motto:Kuu Hae Aloha ("my beloved flag"). Most of the 40,000 Native Hawaiians, including Liliʻuokalani and the royal family, shuttered themselves in their homes, protesting what they considered an illegal transaction. "When the news of Annexation came it was bitterer than death to me", Liliuokalani's niece, Princess Ka'iulani, told the San Francisco Chronicle. "It was bad enough to lose the throne, but infinitely worse to have the flag go down". The Hawaiian flag was lowered for the last time while the Royal Hawaiian Band played the Hawaiian national anthem, Hawaiʻi Ponoʻi. One Hawaiian said "Our beloved flag, quivered as though itself in protest of the final quavering notes of Hawaii Ponoʻi". The Hawaiian Islands officially became the Territory of Hawaii, a United States territory, with a new government established on February 22, 1900. Sanford Dole was appointed as the first governor. ʻIolani Palace served as the capitol of the Hawaiian government until 1969. Was the 1893 overthrow of the monarchy illegal? Obviously, all revolutions are illegal. The American revolution of 1776 was also illegal. Were most of the people living in Hawai'i at the time of the overthrow opposed to it, in favor of it, or apathetic? We do not know, just as we do not know similar information about the American revolution. There was no Gallup or Zogby poll back then. ONSLAUGHT OF SPRING AND THE WEATHER WAR? Did George H.W. Bush Coordinate a JFK Hit Team?